The weather changes in Helsinki are pretty abrupt and I have never seen such changes before. This weekend was fantastic with the temperature being in positives and Monday morning suddenly is -14 degrees! Crazy. The above graph is from http://www.ilmatieteenlaitos.fi/weather/local.html?kunta=Espoo and it shows the temperature over the past 24 hours. Notice that in the last 12 hours, the temperature dropped about 15 degrees. a) airline companies: to calculate the fuel they need for a trip, the visibility conditions at the airport and stuff like that. b) energy companies: to predict the short-term demand for energy. The Helsinki energy company, for example, could really use this information to predict how much of heating needs would increase in the next day and keep their supply up to date. c) you and i: to decide what clothes to wear the next day; to carry an umbrella or not or to take a vacation in someplace or not. Of the above, option (c) would pay nothing to learn of weather forecasts, but apparently the first two of the lot would happily part with lots of money to get more accurate information. This picture hardly captures what the scene looked like. 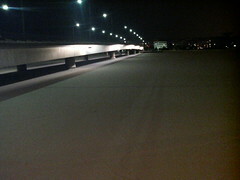 While strolling around on a cold evening, I took some pictures of the sea along side the bridge. The snow over the lake is so uniform that it almost looks magical. It is here that I saw 3 dudes ice-skating! The first image was taken on October 28th, 2006 which the second one was taken on January 31st 2007. Since I keep taking quite a bunch of pictures, I decided to put them in one folder hoping to see a story develop over time. I will put up a few that are interesting and see more you are welcome to look at the flickr set here. All pictures are clickable to larger versions. 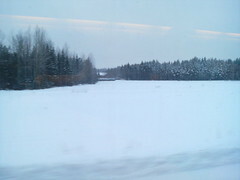 On a trip last week, I took the train to Tampere, a nearby city. The train touches a max speed of 200kmph and I know it since they display it on the screens inside. On the way back after a tiring day full of meetings, I decided to take some pictures of the view I could see. I still sometimes feel “blessed” to see a bit of sunlight after 5 PM! 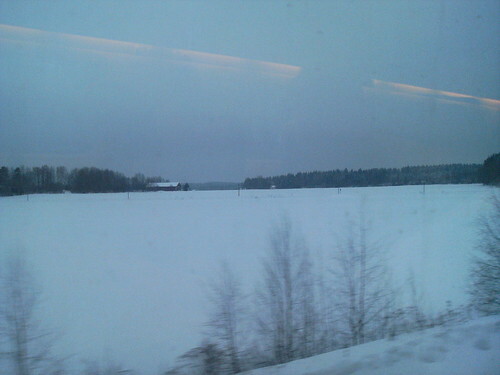 On a similar trip once to Oulu, all I could see was darkness since it was November back then. So well, back to the pictures I was trying to take at that speed. I noticed that the LCD display in the camera did not show upright objects as upright. They were all tilted towards the direction in which the train was going – which happenned due to the slower refresh rate of the display. The images would not show this slant, however since the time it takes to “capture” the image from the CCD (charge coupled device) to the phone’s working memory is much lesser than the time it takes to process those bits and display them onto the screen. Look at the above picture for example. 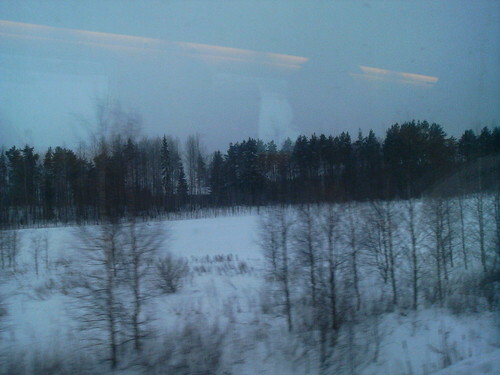 Since the train was moving so fast, I am sure that the trees closer to the train are not shown in the same place as they really are. Motion changes the view. Some of the images were clear enough because most objects in the image were further away. Objects closer to the camera would be more distorted than the ones further away. All of those pictures are uploaded here. You are free to download the hi-res ones and study them for yourself if you want. I recently finished reading the The Kite Runner and I finished the book in just two days. The story in the past and something about the childhood of the author was similar to mine. Having enjoyed it so much, I decided that I must resume my reading habits and this time, give fiction a chance. Maybe I had started calculating ROI on the reading of books, so all my reading time was spent on Fortune, National Geographic and similar sources. I have now come to realize that I cannot keep up with the rate of publication of new and interesting stuff in these areas so why even try ? Thanks to the virus-killer, who recommended me the Kite Runner in the first place, I received recommendations for the Papillon and Shantaram. And then, my father recommends “Discover the CEO within“. it is still so difficult for me to understand this transformation! Anybody in for this ?